The pension plan enacted by the State of Illinois on December 5, 2013 may preserve more of the benefit increases for current employees than is widely assumed, due to a provision of the new law that ties benefit growth to inflation. As discussed here, the new benefit increase is based on years of service and a multiplier that starts at $1,000 for a retiree not covered by Social Security ($800 for a retiree covered by Social Security). The multiplier rises each year by the increase in the Consumer Price Index (CPI), beginning on January 1, 2016. This means that only those who retire before 2016 are affected by the initial multiplier of $1,000 (or $800). Future retirees start with a higher multiplier due to inflation, resulting in larger benefit increases. Given the complexity of the formula, it might be mistakenly assumed that the initial multiplier is set at $1,000 (or $800) for all retirees, regardless of when they retire. An analysis of the law for the We Are One Illinois coalition of public employee unions appears to have been based on this assumption. A clear explanation of how the new benefit increase works is available on the website of the State Employees’ Retirement System (SERS). The new law applies to SERS and three other State-funded retirement systems: the Teachers’ Retirement System (TRS), the State Universities Retirement System (SURS) and the General Assembly Retirement System (GARS). The Judges’ Retirement System (JRS) is not affected. Despite the inflation adjustments, the reduction in annual benefit increases is the largest source of expected State savings from Public Act 98-0599. According to supporters, the law will immediately reduce the State’s unfunded pension liability of approximately $100 billion by 20% and reduce State pension contributions by $160 billion over 30 years. The legislation affects employees hired before January 1, 2011, known as Tier 1 employees; pension benefits for new, or Tier 2, employees were previously reduced by a law enacted in 2010. Annual benefit increases are currently paid at a compounded rate of 3% for retirees and for Tier 1 employees, upon retirement. Under the new legislation, which is scheduled to take effect on June 1, 2014, the 3% compounded benefit increase applies only to benefits below a specified threshold. The initial threshold is equal to $1,000 times years of service for the majority of participants, who are not covered by Social Security, and $800 times years of service for those covered by Social Security. For example, for a retiree with 30 years of service, the initial thresholds are $30,000 or $24,000. The multiplier of $1,000 or $800 increases each year by the increase in the CPI, beginning on January 1, 2016. 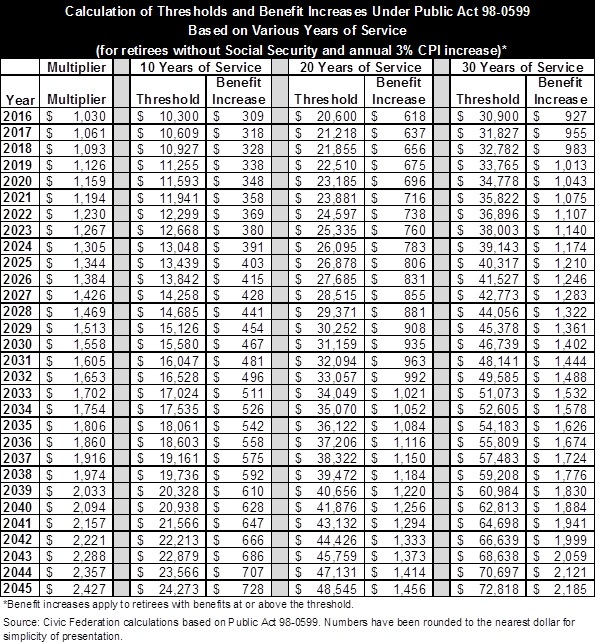 The following table shows the increase in the multiplier over 30 years and the corresponding increase in threshold amounts, based on 30 years of service and an annual CPI increase of 3%. An employee who retires in 2025 and is not covered by Social Security would start with a multiplier of $1,344 and a threshold of $40,317. Once the retirement benefit reaches the threshold, the annual benefit increase is equal to 3% of the annually calculated threshold amount. This formula, while complicated, is intended to protect retirees with modest pensions and many years of service. The legislation also requires current employees to skip between one and five annual increases when they retire, depending on their current age. 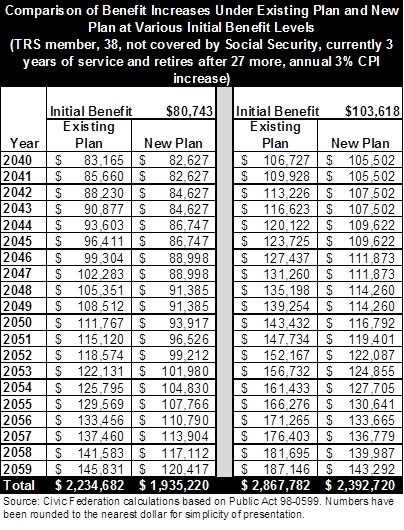 As explained here, for a retiree with a current benefit of $25,000 and 30 years of service, the annual benefit based on the new increase after 24 years is $50,332. That represents a decrease of $488, or less than 1%, from the $50,820 annual benefit based on the existing 3% compounded increase. In contrast, a retiree with a current benefit of $110,000 and 30 years of service would receive an annual benefit of $140,984 after 24 years based on the new increase. The annual benefit declines by $82,623, or 37.0%, from $223,607 based on the existing increase. 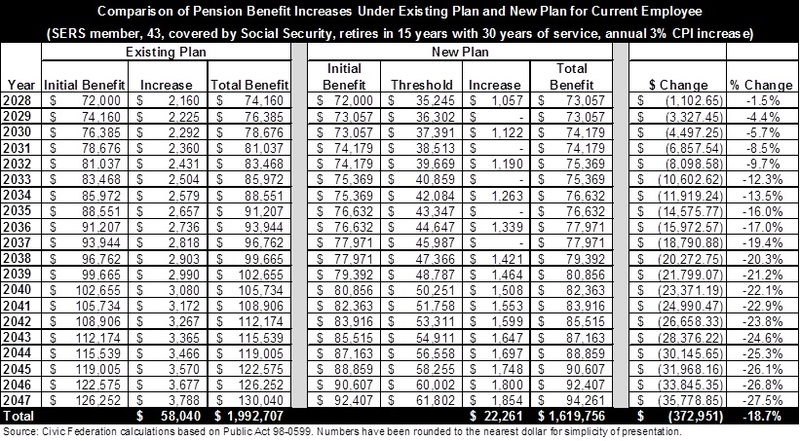 The next table compares benefit increases under the existing plan and new plan for a SERS member covered by Social Security who is 43 years old when the law takes effect. The individual is assumed to retire in 15 years with 30 years of service and an initial benefit of $72,000. The annual CPI increase is assumed to be 3%. Because he is 43, the employee must forfeit five annual increases upon retirement. The increases are skipped every other year for ten years, beginning with the second scheduled increase. The individual’s retirement age also increases by one year. After 20 years of retirement, this individual’s annual benefit is $130,040 under the existing pension plan and $94,261 under the new plan, a decrease of 27.5%. Total benefits paid over the period decline by 18.7% from $2.0 million to $1.6 million. The next table compares annual benefit increases under the existing plan and new plan for a 38-year-old TRS member at two levels of initial benefits. This individual is not covered by Social Security, has worked as a public school teacher outside of Chicago for three years and will retire in 27 years with 30 years of service. 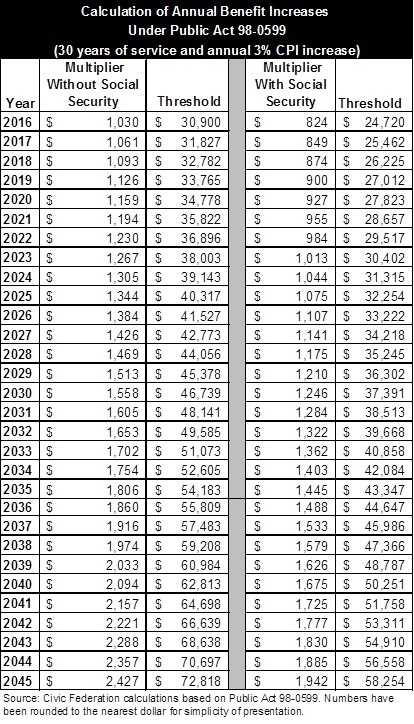 Initial pension benefits in 2040 were based on the lowest and median beginning salaries for Illinois public school teachers in 2010 and TRS’ assumption that average salaries in that age range will increase by approximately 6.25% a year. The table assumes an inflation rate of 3% a year. Due to the individual’s age, five years of benefit increases must be forfeited upon retirement and the retirement age increases by two years eight months. Under the new plan, the lower-paid employee would receive an annual benefit of $120,417 after 20 years, a decrease of $25,414 or 17.4% from $145,831 under the existing plan. The annual benefit of the higher-paid employee would be $143,292 after 20 years under the new plan, a decrease of $43,854 or 23.4% from $187,146 under the existing plan. The cumulative benefit reduction during the period is $299,462, or 13.4%, for the lower-paid employee and $475,062, or 16.6%, for the higher-paid worker. The previous examples involved employees who retired after 30 years of service. The benefit increase formula in the new law is designed to reward long-serving employees. For employees with fewer years of service, the threshold is lower, resulting in smaller annual benefit increases. The next table compares benefit increases for retirees not covered by Social Security with 10, 20 and 30 years of service. The annual inflation rate is assumed to be 3%. The benefit increases in the table apply to retirees with benefits at or above the threshold; those with benefits below the threshold receive 3% compounded increases. The initial threshold amount for an employee who retires in 2025 with 10 years of service is $13,439, compared with $26,878 for a 20-year employee and $40,317 for a 30-year employee. Annual benefit increases grow proportionately, from $403 to $806 to $1,210.